Ingredients: Coconut oil, Cannabis oil. Purchasing this product will earn you 75 Greenbucks! 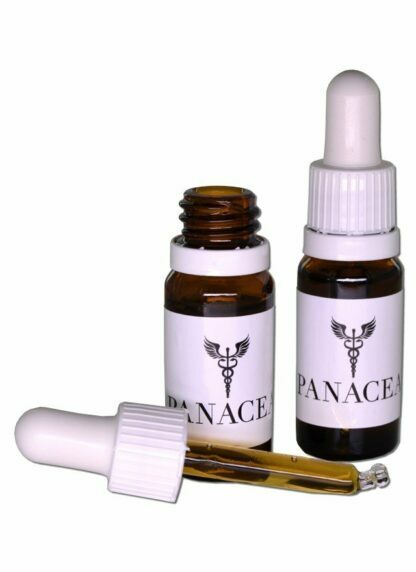 Panacea Cannabis Oil Tincture is a high-quality medical-grade cannabis oil that contains a 1:1 CBD/THC blend which has potent medicinal and therapeutic effects for many conditions. Panacea cannabis oil at the recommended dosage lacks the psychoactive effect commonly associated with a marijuana high. Recent research has identified CBD/THC as an effective alternative treatment for cancer, epilepsy, fibromyalgia, depression, ADHD, Crohn’s disease, anxiety and many more. Panacea cannabis oil is a natural therapy that can be used safely and effectively on elderly people, children and even pets. We grow and produce with integrity and a commitment to our users to produce quality medication. We only use organic oils and organic carrier oils. For reference, each Panacea Cannabis Oil Capsule is equivalent to approximately 25 drops of the Panacea Cannabis Oil Tincture. The capsules are recommended for cancer patients and those in severe pain. Consult your physician before use, especially if you have any medical condition or are taking any medications. This is a food supplement and does not claim to cure a disease. Insomnia: 6-8 drops of oil 40mins before bed. 3-5 drops twice a day. Dosage depends on the person’s weight and the severity of the depression/anxiety/stress. Cancer: 5 drops three times daily and a capsule at night. Advanced cancer: 10 drops three times daily and a capsule at night. First use I got a bit of a light headache, however I become acquired to the use of the oil. It does work however not as strong or effectively as other oils I have used in the past. I still have less anxiety after its use, but I have tried better. I will most likely be going with a different oil in my next purchase.